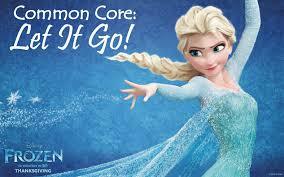 Common Core: Let it Go! On the light side, my kid and I have watched Frozen a zillion times. I crafted a parody in support of refusing the cc tests just for fun. Since I am not the world’s best singer, I will simply provide you with the lyrics. Enjoy! And Cuomo, well he’s just mean. We couldnt repeal cc, oh how we tried. Well now parents and teachers know! Common Core, Common Core…I cant take it anymore! Common Core, Common Core, I want to shove PARCC out the door! Isnt used to help our kids at all! No right no wrong, no bubbling in A, B or C – we’re free! I wont drink the cool aid, dont pass that cup my way! Duncan’s threats never bothered me anyway.